I hate how many of my posts start with information on the weather, but hey, I live in Oklahoma. And tornado-watch season officially began last night, which means I've got a bag full of water bottles and granola bars for basement hideouts, regular tv programming turns into constant storm warnings, and my iPhone weather app has hail icons all over it. Funsies. Now, on to the outfit. I bought this dress back in October, but I've never worn it on the blog. I got it thinking it would be incredibly versatile, but honestly, it's just a little too short to wear to work. Even so, I'm still glad I bought it for $12. Totally worth it to wear just to wear with my new rain boots even once. You guys, I love them. I keep them by the front door and think of any excuse to wear them. "Oh, the dog needs to go out? 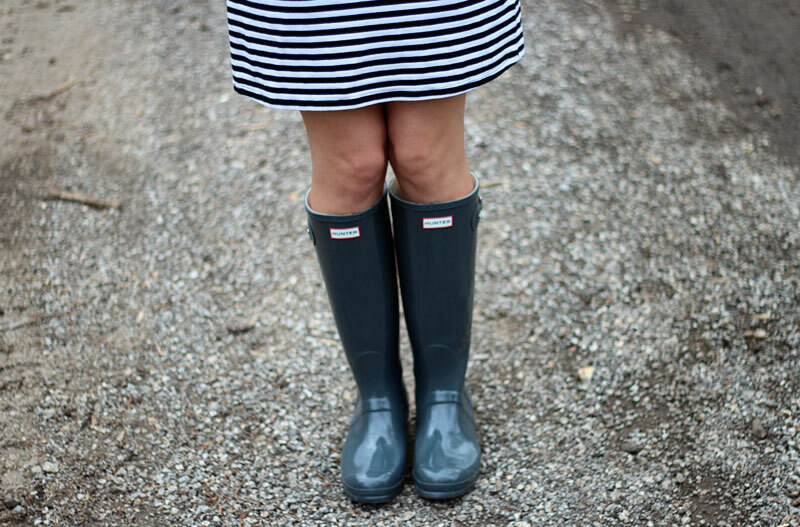 Let me put on my rain boots and go outside to keep him company while he goes to the bathroom." "You want me to bring in that package from the front porch? Oh well, let me put on my rain boots so my socks don't get dirty." You guys, I love them. so cute! wish i had some rain boots - i'd totally find excuses to wear them! Oh, my goodness. I have the same dress! It totally looks better on you. Mine is a bit hip huggie. I recently did a post where I wore that dress 7 ways. I never nailed the scarf though and you totally did! Nice work. I remember that post! I remember commenting on it because it motivated me to actually wear the dress :) I like ALL 7 ways you styled it! Tornado weather is no fun but at least you look adorable! 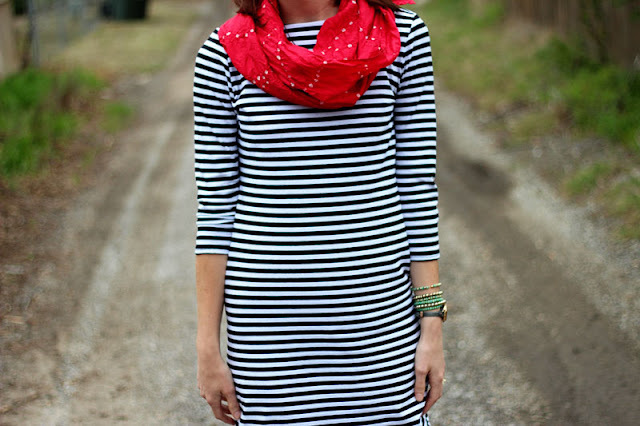 This is the best way I have seen a striped dress lately. 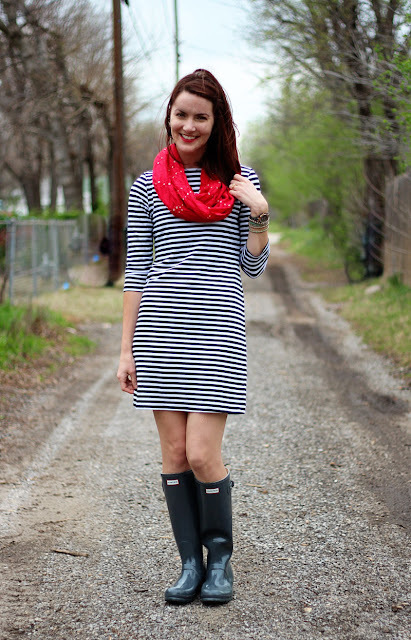 It's so simple but oh so perfect with that scarf and the rain boots. Love this look! 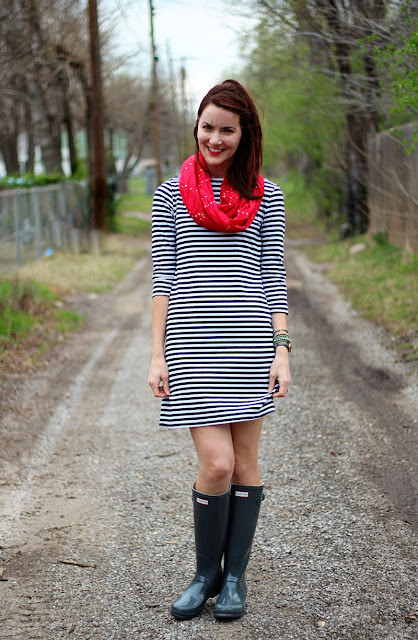 Oh, I've been dying for a striped dress like this! You look great Nd this is definitely one of favorites of your! I dont think the dress looks short but if you want, can always wear with skinny jeans & turn it into a tunic top during cold weather with the boots & then it really gets versatile. Stripes never go out of fashion, so $12 is well worth it. That's a good idea! I've worn the dress with leggings and boots in the winter, but I hadn't thought of pairing it with jeans. And I agree - for $12, it was totally worth it! I tried on a very similar dress last week and almost bought it. Now I'm wishing I had. You styled it so perfectly. 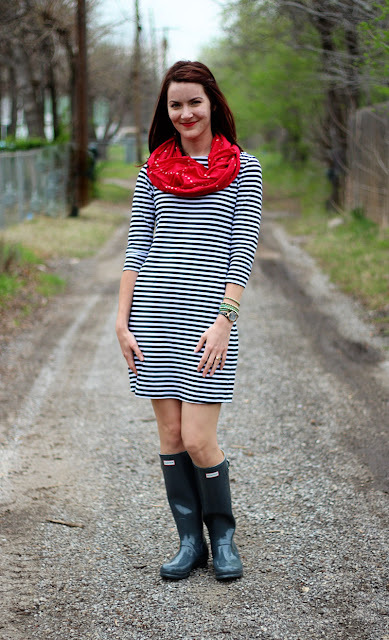 I love the Wellies and bright scarf. Your photos are gorgeous too! I hear you. I wear mine to work. People thought I was odd. Started doing it about two years ago. Now look how entrend we all are. But beside that, they're warm and comfy and cool! Love them. Doooooo it! I had a cheaper pair of boots that busted open one day and I just decided I needed something that would last me a much longer time. I had to give up buying any other clothes for a month, but it was totally worth it! 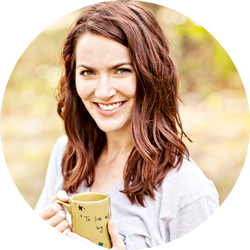 Your style is so simple, pretty and put together! I love love loveee black and white stripes, so I have no reason not to love this outfit! 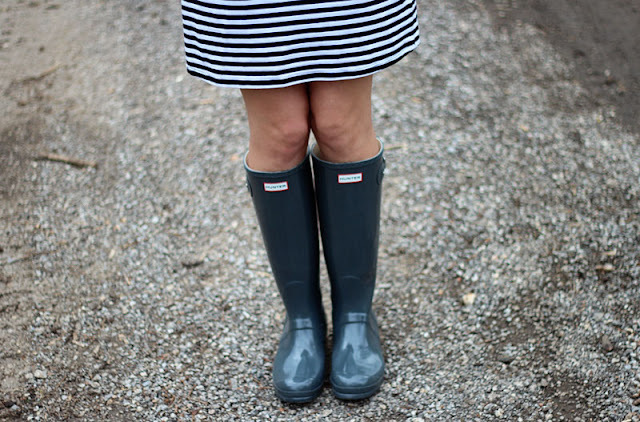 Those rain boots are adorable too! Ohmygosh I love the black and white stripes with your red scarf, and the boots just make it even cuter! It was really hard for me to buy them too - I HATE spending money! But I feel like they were a good investment, I'm sure I'll have them forever. Mine are actually the high gloss gray - they are a little hard to photograph so sorry about the confusion! I love the scarf with this dress. Makes the whole outfit pop! A classic striped dress is a spring essential - and I don't have one! Love this version and the scarf is the perfect accessory! this dress looks amazing on you! so flattering! and yes, i would find any excuse to wear those boots, too!! This is an ADORABLE outfit. I recently bought a pair of Hunter wellies too, so I completely understand you obsession. Any excuse to throw them on is a good one! I think I have that same dress in black. I agree it's a tad short for work. I wore mine and then tugged on it all day long. I agree - it's just a tiiiny bit too short :( I wore mine to work with tights once and every time I stood up, I had to adjust it. But I love the look so I'm sure I'll continue to endure the uncomfortable-ness! Oh Sweetheart it's lovely to see you wearing your Wellies, I wear Wellies all the time, it would be fun to wear them together. I love this dress! Truthfully, I love anything Target. And it looks great with the wellies! I love my Hunter Wellingtons and wear them whatever the weather and seeing you with your Wellingtons on makes me very happy and I'm so glad that you love them too. And trust me, I am getting "flood warnings" constantly on my phone here in Illinois. Although I don't mind the rain. Floods, sure. But rain, not so much. Especially if I had Hunter rainboots ;) HE HE! I hope you are safe and sound in OK! Love your outfit girl!! I'm all about stripes for spring! Love the Hunters with the stripes ;) I have a striped one I picked up from F21 that is too short for work too...it has been great for weekends though! Love the chic stripe dress!! !